While mobile phones are vastly directing people from other mediums such as PCs, to become the #1 used gadget around the world, social media and its convenient integration with mobile devices is considered the major reason for such a turnover to occur during the past 8 years. The usage of social media is the highest amongst active internet users, with almost 1.96 billion active social network users around the world. And one of the most common behaviors of socializing on such networks is posting statuses; to share and communicate ideas and thoughts to others. Globitel saw the need to invest in such a behavior and extend it to mobile handset devices, while keeping (if not increasing) the rates of call completion and penetration for operators. Thus, the MyStatus solution was introduced to combine the best of both telephony calls, and social media status posting. The service aims to empower the individualized user experience all operators are eager to develop. With its social media like features, My Status satisfi­es the need to deliver messages to designated individuals or a vast audience. 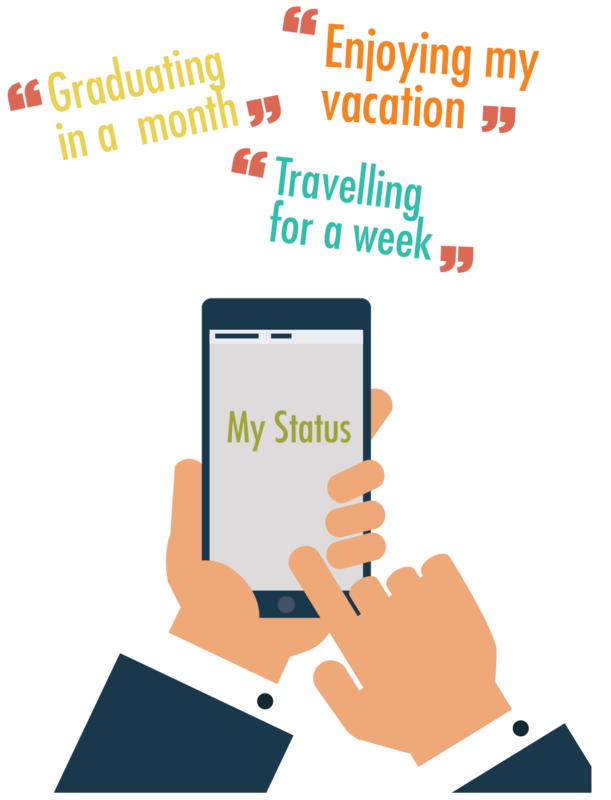 My Status allows the subscriber to propagate a signature or status to the called or caller party, and retrieve the party’s pre-set status to be viewed before the call connects, all through the convenience of simple ‑ash SMS. Introduce a new social networking VAS service to entice users. Increase calling penetration and completion. Increase both subscription-based and advertising-based revenue. Gain a competitive distinguisher among other mobile network operators. Express individuality, and keep contacts updated. Satisfy the status posting behavior. Interact with an enriched user experience through easy commands. Ability to introduce oneself to fi­rst-time dialed party, so it will increase the chances for call completion.